Moscow is a city full of contrasts: ancient monasteries and ultra-modern monoliths stand side by side, and New Russian millionaires and poverty-stricken pensioners walk the same streets. The city is the barometer and nucleus of the changes sweeping through Russia. People now prefer impromptu street markets to monothilic department stores, and the beautiful churches vandalised or abandoned during the Soviet era of hardline atheism are being lovingly restored. But the real flavour of this city is in its small nooks and crannies, each of them unique. 11th century: In this time were probably settled The Kremlin and its surrounds, but the founding of Moscow is traditionally ascribed to Yury Dolgoruky, Prince of Suzdal, who is recorded as giving a feast here in 1147. 1237-38: Moscow was sacked along with the rest of the Vladimir-Suzdal realm by Tatars led by Batu, Genghis Khan's grandson. These Tatars set up a capital at Saray on the southern Volga and became known as the Golden Horde. Moscow, near river trade routes, became a princedom in its own right, and emerged as the Golden Horde's chief northern tribute collector. 15th century: Under Prince Ivan III (the Great) that Moscow could cease paying tribute to the Horde. 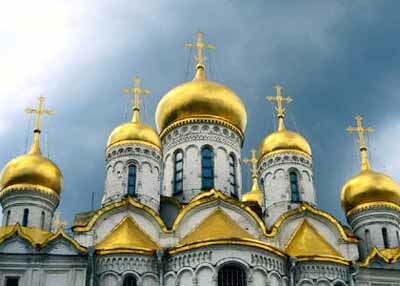 Ivan brought Italian architects to build cathedrals in the Kremlin and styled himself 'Ruler of all Russia'. By the end of Ivan's reign, Moscow's control stretched from Novgorod in the west to Tula in the south, towards the Urals in the east and to the Barents Sea in the north. 1571: The city had over 200,000 people and was one of the biggest in the world. Ivan IV (the Terrible) expanded Muscovite territory by launching the conquest of Siberia and winning control of the Volga region. The Prime Minister, Boris Godunov, faced famine and a Polish-backed invasion. The seven years after his death were the Time of Troubles, characterised by civil war, invasions and a Polish occupation of Moscow. The Poles were finally driven out by Cossack soldiers and 16-year-old Mikhail Romanov was elected tsar by a council of nobles, launching the 300-year Romanov dynasty and a period of consolidation during which Moscow's territory spread southwards. 1697-98: Peter the Great toured Europe. He built a new capital, St Petersburg, on the Baltic to open Russia up to Western trade and ideas and to consolidate military victories over Sweden. He forced the nobility to move to St Petersburg and wear Western-style clothes and slapped a tax on beards, symbol of the old, inward-looking Russia. He disliked Moscow, where as a boy he had seen his uncle and his mother's advisers killed in a palace coup. 1812: Moscow remained important enough to be Napoleon's main goal when his troops marched on Russia. After the bloody Battle of Borodino, 130km west of the city, the Russians abandoned Moscow and allowed Napoleon to march in and install himself in the Kremlin. The night he arrived a great fire broke out which burnt most of the city, including the stores. With winter coming, the French had to pull out little more than a month after they had arrived. Moscow was feverishly rebuilt and the city's population swelled. 1917: On October saw more savage street fighting in Moscow than in St Petersburg. The Bolsheviks occupied, lost and retook the Kremlin over an eight-day period. 1918: The government moved back to Moscow after two centuries' absence, fearing that St Petersburg (then Petrograd) might come under German attack. Moscow became the epicentre of the country's total re-organisation. Under Stalin, one of the world's first comprehensive urban plans was devised for Moscow. The first line of the metro was completed in 1935. 1941: Hitler broke the nonaggression pact he had signed with Stalin and German troops came within 40km (25mi) of the Kremlin. As with Napoleon's army, they were halted by the cruel Russian winter, Moscow's best defence. After WWII, huge housing estates grew up round the outskirts. 1980: Moscow had been in the forefront of political change, and a thorn in the flesh of the national leaders, since the first whispers of glasnost (openness). Boris Yeltsin, made the city's new Communist Party chief in 1985, became hugely popular as he sacked hundreds of corrupt commercial managers, set up new food markets and permitted demonstrations. This last move was too much for the communist old guard and led to Yeltsin's resignation in 1987; his time at the centre of Russian political life was by no means done. 1991: It was the rallying of Muscovites behind Yeltsin at Moscow's 'White House', seat of the parliament of the Russian Republic, that foiled the old-guard coup and precipitated the ultimate collapse of the Soviet Union. By the mid-1990s Moscow was very much the vanguard of the 'new Russia', filling up with all the things Russians had expected capitalism to bring but which had barely begun to percolate down to the provinces: banks, stock exchanges, casinos, advertising, BMWs, new shops, hotels, restaurants and nightlife - money. And with it, a wave of organised crime. Vladimir Putin, who replaced Yeltsin as Russian president at the end of the millennium, seems determined to firm up state control of Moscow's business dealings, as well as its social scene. Still, Muscovites - the younger generation especially - are revelling in their new-found freedoms. Moscow remains the most free-wheeling city in Russia; for the cynics there are no surprises, and for the ambitious there are no limits. Outside the garishly wealthy 'New Russians', people are doing it hard, with education and health devastated and many older Russians begging and scrimping at the margins of Moscow's new marketplace.